The majority of women involved in Iceland’s fisheries sector work in fish processing and have immigrated to Iceland from other countries to work in the industry. Using data collected through interviews and surveys, this paper compares and contrasts the experiences of Icelandic and immigrant women who work in fish processing plants in the Westfjords of Iceland. It shows that Polish women experience a lower job satisfaction than Filipino women. As more women immigrate to places like Iceland to work in fisheries, it is important to understand their roles and perceptions of their jobs, since being satisfied with work can influence overall quality of life. In the Westfjords of Iceland, fish processing plants process fish from large-scale fisheries, small-scale fisheries, and aquaculture farms. The majority of people who work in fish processing plants are women, mostly from countries outside of Iceland, and the job market in Iceland into which these immigrant women enter is generally gender divided (Júlíusdóttir et al. 2013). Polish women are the largest group of immigrant women and are almost 40% of all immigrant women in Iceland (Statistics Iceland nd). Coming from a country within the European Economic Area, they do not need a work permit to work in Iceland. Since 2006, women coming from outside the European Economic Area can only arrive to be united with their parents, children, or spouses, to marry an Icelandic person, or as specialists in fields like nursing (Skaptadóttir 2015). In the past, many women from countries such as the Philippines or Thailand moved to Iceland to be with a spouse or to work in fish processing and still work there today. This paper explores the experiences of women who work in fish processing plants in Iceland and how these experiences are affected by gender and nationality. This paper will address the question, what are the roles and perceptions of women involved in fish processing in the Westfjords of Iceland? As the theory of intersectionality suggests, the multiple identities that marginalized groups face must be looked at all together to shed light on hierarchal social positions (Acker 2006; Flippen 2013; McDowell 2008). Identities based on gender and nationality together affect peoples’ experiences and positions. For example, Glenn (1992) discusses how racial divisions of labor must be challenged alongside gendered divisions of labor. She uses reproductive labor (i.e., care giving and domestic labor) to show that white women will overlook the fact that racialized women do the labor that nobody else wants to do so that white women do not have to do it. At the same time, white women do not challenge the fact that it is women in general who do this kind of work. In the case of this study, women’s experiences of working in fish processing in Iceland are influenced by a combination of their gender, nationality, and educational background. Research must pay attention to how these factors intersect in work organizations where inequalities exist (Acker 2006). A common job for women in fishing communities is to work in fish processing plants. Jobs in the fish processing industry have traditionally displayed an apparent division of labor, in which men and women do different jobs depending on the qualities that they are seen to have (Husmo 1999). When entering the labor market, it is common for women and men to be segregated by their stereotypical abilities (Anker et al. 2003). One outcome of this separation is the different statuses that men and women then hold in the workplace. The unequal status that men and women have in the workplace can be seen in the way that jobs are described. For example, a woman’s job may be seen as easy or unskilled, while a man’s job would be defined as difficult or skilled (Skaptadóttir and Rafnsdóttir 2000). In Iceland, fish processing jobs are unionized and women and men are paid the same if they do the same job. However, women have predominated in low-paying jobs within the industry which are perceived as unskilled (Skaptadóttir and Rafnsdóttir 2000). Outside of leadership positions in fish processing plants in Iceland, women mainly work on the production line where they cut, clean, and package fish, whereas men mostly work in the freezer or drive machinery. Women’s perceptions of their work in fish processing have to some extent shifted in the last few decades. In the 1990s, Skaptadóttir (1996) found that although women complained about the monotony of the work in fish processing, they also took pride in the work that they did. They took comfort in knowing that they were providing for the entire nation, and they saw themselves as part of a larger identity rather than just a worker in the fish processing sector. A little over a decade later, Karlsdóttir (2008) found that women generally did not discuss their complaints with work in the fish processing sector because they were trying to cope with the work through positivity, or they did not feel as if they were entitled to better positions, such as a leadership role. Five years after Karlsdóttir’s study, and although work in fish processing had been valued in the past, work in fish processing became viewed as labor that no Icelandic person would want to do (Júlíusdóttir et al. 2013). In Iceland and elsewhere, fish processing work takes its toll on people both physically and mentally, and many local women do not want to be involved in the industry (Kafarowski 2009). For example, in Norway, this work has lost its former status and has been predominantly performed by foreign women and men since the 1980s. Currently, these people are mostly from Eastern Europe, but in the beginning, they were refugees and people from Asia (Østlie 2018). Icelandic women who commonly worked in these jobs until the end of the twentieth century have increasingly sought other employment opportunities outside of the fisheries. These jobs are in the growing service sector, both in rural areas and urban centers. Many of these jobs require a higher education degree, which more Icelandic women are pursuing than in the past. Such jobs in fish processing have therefore been filled by immigrant workers from places like Poland, where unemployment is high and wages are relatively low compared to Iceland (Karlsdóttir 2008; Júlíusdóttir et al. 2013; Skaptadóttir 2004). When immigrants move to a new country, they often end up working in an unskilled position, even if they have skills that they acquired in their home country (Fossland 2013; Napierała and Wojtynska 2017). Therefore, immigrant women are the ones working in the positions in the fish processing sector that are seen as unskilled and that nobody else wants to do. Although there are numerous ways to measure quality of life, one way is through job satisfaction. As García-Quijano et al. (2015: p. 155) states in their study on well-being in coastal Puerto Rico, “job satisfaction has found to be a key variable in other quality of life and well-being studies.” In Iceland, the work that women do in fish processing is often devalued by society, and their labor, segregated by gender, is often considered unskilled (Skaptadóttir and Rafnsdóttir 2000; Karlsdóttir 2008). Women’s experiences in the workplace are therefore particularly important to assess because their job satisfaction could be affecting their quality of life. This study used quantitative and qualitative methods to gain data to obtain a broad view of the roles and perceptions of the women studied. Qualitative data were gathered through ten semi-structured interviews to provide in-depth details about the lives of the participants. The interview participants were from Poland, the Philippines, and Iceland. Women from these countries were interviewed because they represented the majority of women working in fish processing, and they spoke English, the language in which the interviews were conducted. The participants were recruited using the snow ball method (Hammersley & Atkinson 2007). Each interview lasted between 45 min to 1.5 h, and participants’ ages ranged between 17 and 53. Quantitative data were collected from 93 respondents with a survey about job satisfaction. This method was chosen to access a larger group of women who work in fisheries, aged 17 to 67, especially those who could not speak English. The survey was in the form of 19 questions, nine of which are discussed in this article. It was administered at places where women working in fish processing gathered and was distributed in English, Icelandic, Thai, and Polish, the most commonly spoken languages at the fish processing plants. The surveys were translated using the traditional translation and back-translation method, where a bilingual speaker translates the survey from English to the target language and another bilingual speaker translates the survey back to English to ensure that nothing was lost in translation (Bernard 2006). The questions for this survey were the same questions about job satisfaction used by García-Quijano et al. (2015) in their study because they were tested across cultures to measure job satisfaction of people who use coastal resources. These questions asked about aspects of the job, including earnings, adventure of the job, challenge of the job, healthfulness of the job, job safety, opportunity to be one’s own boss, physical fatigue, predictability of earnings, and time spent away from home. The participants’ possible answers were in the form of a Likert scale, giving participants a range of answer options, including very unsatisfied, unsatisfied, neither unsatisfied or satisfied, satisfied, and very satisfied. Following the study done by García-Quijano et al. (2015), the sum of questions about job satisfaction from the survey was analyzed using the Mann-Whitney U statistic, also known as the Wilcox test in R, the statistical program in RStudio that we used to analyze the data (RStudio Team 2016). The research was conducted in five small towns throughout the northern part of the Westfjords region of Iceland. 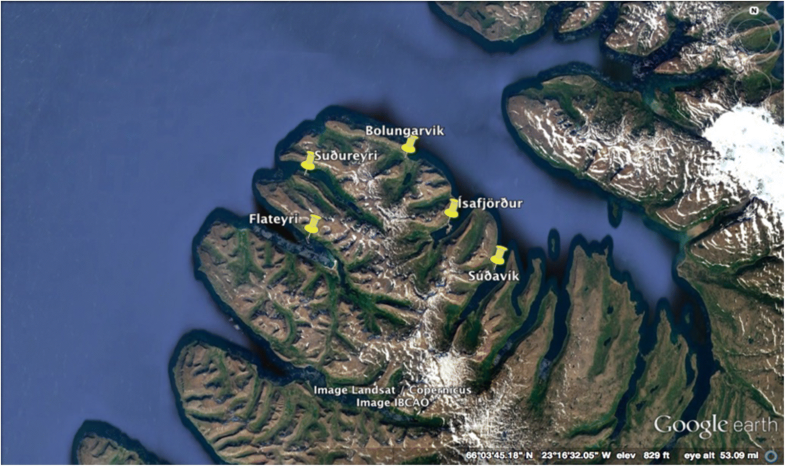 These five towns are all within 25 km of Ísafjörður (population of 2818), the largest town in the Westfjords (Fig. 1). The towns are all built on the coastline and came into being because they were close to good fishing grounds. The Westfjords region was chosen for this study because it is one of the regions in Iceland that depends the most on the fishing sector for its existence (Karlsdóttir 2008). Additionally, this area has experienced a large influx of immigrant workers to work in fish processing since the mid-1990s (Skaptadóttir and Wojtynska 2008). In 2016, immigrants were 14% of the population in the Westfjords (Statistics Iceland 2016). Obtaining a higher education degree did not help immigrant women find better jobs upon moving to Iceland. A woman interviewed who attended university had regretted taking the time to obtain her degree because it did not find her a job in her home country or in Iceland. She expressed this opinion in a mocking tone when talking about looking for a job, saying, “Maybe it would be better to say I just finished primary school to get a job.” This regret over getting a higher education was not echoed by an Icelandic woman who had a higher education degree, however. She held a leadership position in a fish factory and said that her work was interesting and related to her studies in university. Whether or not women in this study were satisfied with the division of labor in Icelandic fish processing plants differed depending on where they were from. The women from the Philippines were less critical of this division than women from Poland or Iceland. When replying to a question about why women mostly work in the lines, a woman from the Philippines said, “Because in the machine part [it] is so hard.” Another woman from the Philippines thought that the division of labor by gender was “not bad” because the men can do the “heavy stuff” and the women can do the “easy stuff.” Although it was primarily Filipino women who thought that gendered labor was okay due to the difficulty of work, they thought that it was only because women could not do the “men’s work,” and not the other way around. The phrase “anyone could do it” was frequently used by women from all three countries in describing their work in the fish factories. By saying this, women were noting that men could do their jobs but that women could not do the jobs that men do. Perceptions of people from other countries also varied depending on where women were from. Icelandic participants expressed more negative attitudes towards people from Poland than towards people from other countries. For example, one Icelandic woman in describing people from Poland claimed that some Polish people just want to have a job where they can do as little as possible. She expressed a positive opinion of the work ethic from people from the Philippines, however. The survey data on job satisfaction was used to assess job satisfaction overall, since it is a component of quality of life. The data showed that there was a significant difference in job satisfaction between women from Poland and women from the Philippines (Wilcox W = 485, p value = 0.0007151). By looking at individual questions, trends emerged in the job satisfaction of women surveyed (Figs. 2, 3, and 4). Women from Poland are most unsatisfied with the healthfulness of the job (which includes both mind and body health), whereas women from the Philippines are most unsatisfied with the physical fatigue of the job. Completely different from the immigrant women, Icelandic women are most unsatisfied by their actual earnings. When it comes to factors that women are most satisfied with in relation to their job, women from Poland and the Philippines are satisfied with their job safety, whereas women from Iceland are satisfied with the physical fatigue of the job. The experiences of women who work in fish processing in the Westfjords of Iceland are influenced by the intersection of gender, nationality, and education. Intersectionality theory looks at how these identities intersect to better understand people’s position and their experiences of inequality (Acker 2006; Flippen 2013; McDowell 2008). This paper looks at these identities and positions, in addition to job satisfaction, to better understand the lives of women who work in fish processing, an essential industry in Iceland. The majority of women who work in fish processing in the Westfjords of Iceland are from other countries and see their work primarily as just a job to earn higher wages than in their country of origin. This differs from the views Skaptadóttir (1996) found among women who worked in fish processing in the early 1990s. At the time, women, who were mostly Icelandic, saw their work as important because it was contributing to the economy and was providing food for many people. The majority of women in fish processing today are from other countries and may not have the same connection and identity to fisheries that Icelandic people have had in the past. Now, women who work in fish processing associate work in the fish plants with Iceland and holidays in their home countries. A previous study done among Polish people in the Westfjords by Skaptadóttir and Wojtynska (2008) found that leisure time is largely associated with holidays spent in immigrants’ home countries, too. Even if immigrant women do not like their job in Iceland, they make enough money to possibly experience an upward economic benefit in Iceland and an upward social mobility in their home countries, as compared to their previous circumstances (Skaptadóttir 2015). Regardless of educational background, the immigrant participants of this study could not find a job other than one in fish processing. There is a global problem of immigrant workers being demoted to a lower position than what they would have held in their home countries. In this study, like that of Fossland (2013) in Norway, immigrant women had trouble finding employment opportunities that correlated to their education or experience level. Immigrant women could only find employment in fish factories, where women’s work is considered unskilled, or easier and valued less, while men’s work is considered as something requiring skill and strength, which gives it a higher value (Skaptadóttir and Rafnsdóttir 2000). Therefore, by having no other option but to work in fish processing, some immigrant women have no other choice but to work in a job that is not correlated to their level of skill. Júlíusdóttir et al. (2013) who looked at labor in Iceland through an intersectional lens pointed out that class intersects with gender and ethnicity because educated and skilled immigrants come to Iceland and, for the most part, have no option but to work in the lowest paid, unskilled jobs. Gendered labor exists in Icelandic fish processing plants, and it affects both Icelandic and immigrant women. Being separated by stereotypical abilities due to gender is common in the labor market (Anker et al. 2003). In the workplace, these stereotypes can create a division of labor by influencing what types of jobs people pursue (Kiaušienė et al. 2011). Skaptadóttir and Rafnsdóttir (2000) found that women were more skeptical of the gendered division of labor than men were. Many of the women questioned the division of labor in fish processing plants in our study, as well. Some women from Iceland and Poland wondered why men cannot do the same work that they do processing fish on boats while on shore, but the Filipino participants were more content with the division of labor due to what they saw as the difficulties of “men’s work.” Filipino women might be more accepting of the division of labor by gender, as well as other difficulties in the workplace, than the other women because they are often able to provide for their families back home, which is a very important goal for many Filipinos working abroad, as discussed in a previous study by Skaptadóttir (2015). Some participants in this study discussed men’s ideas of gendered labor. One woman said that men cannot have varied work because they would make fun of each other, which is a view similar to one found in research done by Skaptadóttir (1996), which showed that some men would rather be unemployed than be humiliated by working a woman’s job in the fish processing plant. Both Skaptadóttir’s and this study show that men do not wish to work in jobs that they think are meant for women because of a fear of being socially chastened. Therefore, the gendered division of labor is maintained for a variety of reasons, such as through the stereotypical views of women, the perceived difficulty of work by women, and the social implications of men doing work that is considered a woman’s job. Additionally, nationality plays an important role in the workplace affecting participants’ experiences and views. For example, immigrant woman sometimes experienced only immigrants getting in trouble at work. Outside of leadership roles, the only complaints made about people from other countries were by Icelandic women about people from Poland. But within leadership roles, some immigrant women thought that only Icelandic people should have a leadership position to keep everyone else equal. The largest complaint by Icelandic women about working in fish processing, however, had nothing to do with nationality and was rather that their roles are looked down upon in society, which may reflect on their privileged positon in this context. All of these factors that women experience in the workplace can affect job satisfaction, but job satisfaction was quantitatively assessed in this study using a survey that asked about aspects of the job that would matter to anyone, regardless of gender or nationality. Job satisfaction is a component of quality of life (García-Quijano et al. 2015). Of the participants in this study, women from Poland had a significantly lower job satisfaction than women from the Philippines. Low job satisfaction, discontent over gendered roles and treatment based on nationality in the workplace, and potentially having to work in an unskilled job when they have marketable skills could significantly affect the experiences of women in Iceland. These factors need to be looked at by the fish processing sector to improve job satisfaction, and therefore overall quality of life, for people who in work in one of Iceland’s most important industries. This paper demonstrates the differences and similarities between the experiences of women involved in fisheries in the Westfjords of Iceland. By asking the question, “what are the roles and perceptions of women involved in fish processing in the Westfjords of Iceland?” It seeks to understand the different experiences that Icelandic and immigrant women face. This study shows how women who work in fish processing in the Westfjords of Iceland are affected by gender and nationality, as well as education, in intersecting ways. It also gives a quantitative assessment of job satisfaction, which is an important element of quality of life, and shows that Polish women have a significantly lower job satisfaction than Filipino women. The authors would like to thank Margaret Willson and Catherine Chambers for their feedback on the master’s thesis from which this data comes. Additionally, the authors would like to thank the participants and all of the people who assisted with the survey translations and data analysis. Funding from the Fulbright Student Program provided AY with her living expenses while completing her master’s thesis while in Iceland. AY conducted the surveys and interviews for this study, as well as analyzed the data. US supervised the project from the very beginning, and both authors wrote and edited this chapter. Anker, Richard, Helinä Melkas, and Alisa Korten. 2003. Gender-based occupational segregation in the 1990’s. InFocus Programme on Promoting the Declaration on Fundamental Principles and Rights at Work. International Labour Office, September 01. http://www.ilo.org/wcmsp5/groups/public/%2D%2D-ed_norm/%2D%2D-declaration/documents/publication/wcms_decl_wp_18_en.pdf. Østlie, Jan-Erik. 2018. Østeuropeere er den perfekte utenlandske arbeider. FriFagbevegelse https://frifagbevegelse.no/nnnarbeideren/osteuropeere-er-den-perfekte-utenlandske-arbeider-6.158.540241.4c6900c968. Retrieved on 26 Aug 2018. RStudio Team. 2016. RStudio: integrated development for R. RStudio, Inc., Boston, MA. URL http://www.rstudio.com/. Statistics Iceland. 2016. Population. http://www.statice.is. Retrieved on 19 Oct 2017.